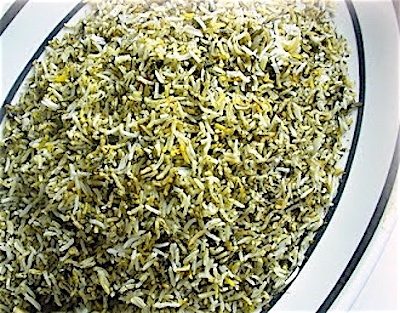 A simplified version of Persian herb turmeric rice called Polo (po-la). My Sephardic roots are Spanish; and while rice is a staple, it is much less the centerpiece of our meals than my cousins from Iraq and Iran. Sticking to my simple recipe principles, I "dumbed down" this recipe as much as I could and still receive rave reviews. 1. Rinse rice until water is clear. Drain well. 2. In a large saucepan over high heat, bring water to a boil. Stir rice into boiling water. Boil uncovered just until rice rises to the surface of the water and you see lines appear on the grains. Drain. 4. Reduce heat to low. Place a thin kitchen towel or paper towel over the pot and cover with a well fitting lid. Simmer for 40 to 45 minutes. QIK tip: The bottom of the pan will be lined with crispy rice, a prized addition called Tadig. If you have a hard time getting the rice from the bottom of the pot can use this little secret...Once that crispy rice/tadig is done run some cold water in the sink and put the bottom of your hot pan in it...It will be much easier to remove.